"Destroy her!" the Duchess shouted with uncharacteristic emotion. "It must be a trick! Do whatever you must!" Patricia gazed at the lace-trimmed invitation and then looked up at Lola, who had just given it to her and waiting patiently for a reply. "You're having an actual tea party this weekend, Lola?" "Wow! I can't believe we're finally in Shenkuu!" May exclaimed, his bushy tail swinging behind him as he swiveled every which way. "It's beautiful," August agreed. "I can't believe you've never been. We live right over in Altador..."
If your Neopet has been bugging you to buy them an electric guitar, this countdown should help you to decide which one is right for them. Vegetarians beware! Here are some of the tastiest meat items! 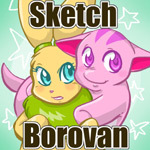 Sketch Borovan- Have you heard? 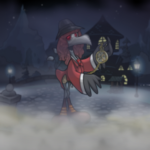 "I'm the ghost of the museum and I've been noticing things moving around and disappearing without me doing anything..."